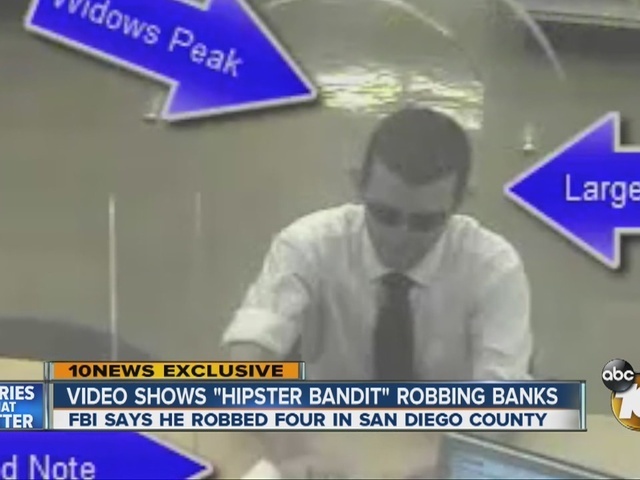 New video from the FBI shows the man dubbed the "Hipster Bandit" robbing banks all over San Diego County. The FBI is working with sheriff's deputies and police to catch the suspect. 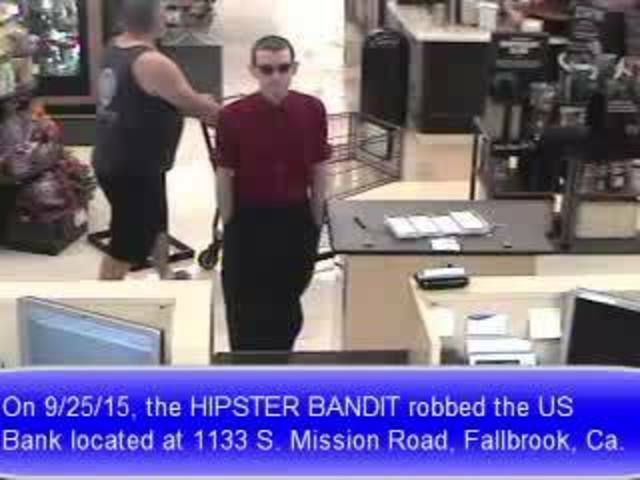 The "Hipster Bandit" is wanted in connection with four bank robberies in San Diego County during the period of July 2, 2015 through January 9, 2016. In each robbery the "Hipster Bandit" has used a demand and targets banks located inside of grocery stores. (1) July 2, 2015, US Bank, 8920 Fletcher Parkway, La Mesa, Calif.
(2) September 25, 2015, US Bank, 1133 Mission Road, Fallbrook, Calif.
(3) November 2, 2015, Wells Fargo Bank, 10675 Scripps Poway Parkway, San Diego, Calif.
(4) January 9, 2016, Wells Fargo Bank, 4725 Clairemont Drive, San Diego, Calif.
Darrell Foxworth says in the latest robbery, the suspect ditched his normal collared shirt and tie for a Star Wars t-shirt. "In his previous robberies, he always seemed to be a little more tailored in his appearance, he was wearing a necktie, he was wearing collared shirts. Now he seems to be slipping." Anyone with information concerning the "Hipster Bandit" is asked to contact the FBI at telephone number (858) 320-1800 or San Diego Crime Stoppers at (888) 540-8477. "It appears that this individual is going to continue to rob until he's caught," Foxworth said.